Includes rates for print, web, classified, and Menus ads. Each week, 18,000 copies of The Sun are distributed throughout Northern Santa Barbara County at over 450 pickup points. We keep a sharp eye out for new locations and monitor every pick-up point like a mama bird keeping watch on her brood. When demographics and population patterns shift, so do we. But we don't do it alone. We work closely with Verified Audit Circulation, one of the nation's premiere newspaper auditing services. You'll find The Sun maintains controlled placement in outdoor racks and boxes, at hotels and motels, retail stores, banks, shopping centers, restaurants, and nightclubs. You'll also find us at the region's major learning institutions Allan Hancock College as well as at area chambers of commerce. If you don't find us someplace, that's probably because someone grabbed the last copy. But you can be sure we'll make note of that and deliver more papers next week. It's easy to reach our upscale, educated readership. Just give our advertising department a call at 805-347-1968. That's why we work with Verified Audit Circulation. The Sun is audited regularly by Verified through its Northern California office (319 Miller Ave., Mill Valley, CA 94941, phone 415-383-3623). Verified is a national company with rigorous and accurate auditing requirements. Each week, The Sun follows a careful, methodical procedure developed by Verified to assure complete distribution accuracy. Verified's guidelines require us to monitor our distribution points weekly, making any adjustments that might be needed. Verified also requires detailed distribution records, including weekly route lists for every distribution point. Verified maintains monthly updates of route lists for its reference and requires us to supply them with detailed quarterly reports. Verified conducts regular, on-site audits of our printing, distribution, and financial records to substantiate all data submitted to them. Verified also conducts visual, on-site audits of how many papers are left at each distribution and how many of the previous week's issue remain. These are random audits conducted quarterly. And Verified provides us with an annual audit report, which we include in our media kit. When it comes to getting The Sun out to our eager readership each week, we want to know exactly what's going on. And we know you do, too. That's why we work with Verified. How would you like all of our readers to know all about your restaurant before they sit down at restaurant? And that's what MENUS is all about: a way for thousands of readers to find out what great fare your restaurant serves, even when they're not in your restaurant yet. MENUS is the premiere restaurant guide of the Central Coast. Because MENUS is the only publication that introduces hungry customers to your restaurant by offering them your menu to peruse. That's why we call it MENUS. And that's why people quickly snap up each issue. Because MENUS makes it convenient for them to have the menus of Central Coast restaurants all in one, handsome publication that they can keep on hand whenever they decide to eat out in the months ahead. That's right, "months" ahead. You see, MENUS is distributed every six months throughout over 300 strategic locations around the Central Coast. Our initial distribution is 50,000 copies. Then we replenish all drop-off points with 35,000 additional copies of MENUS that are carefully monitored over the next six months. Pick-up points for MENUS include chambers of commerce, hotels, college campuses, corporations, shopping centers, and other high-traffic areas, including many New Times racks. MENUS. Food for thought when it comes to reaching hungry customers. 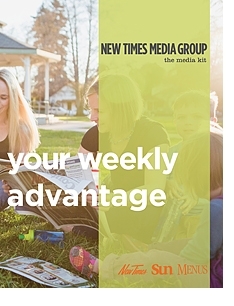 MENUS is a New Times Media Group special publication. The Sun is an award-winning newspaper. The Sun online reaches readers all over town and even around the world. Its easy-to-navigate interface, event listings, and cover story archives combined with 24-hour-accessibility make the site a hit with a growing audience of online readers. Updated weekly with new cover story, listings, helpful local information and popular columns, the Sun is earning repeat visitors as one of northern Santa Barbara Countly's most read web sites. Call for online advertising rates: 805-347-1968. E-mail advertising@newtimesslo.com.